Lapis lazuli designs have captivated us since antiquity, from jewelry, decorative items to paintings, this wonderful gem has always surprised us, but have you ever wondered what is the origin of lapis lazuli and how was it extracted for the first time? Currently, lapis lazuli mining is facing a series of obstacles that have endangered its extraction in the most important deposit. If you want to know more about this process and how was discover this wonderful mineral, keep reading. Exceptionally endowed with reserves, it is in Afghanistan, where we find the origin of the wonderful lapis lazuli, specifically to the north in the district of Kuran Wa Munjan, in the province of Badakhshan. Fabricating the material in Lahore. People have been exploited the mines for more than 6000 years, since the first known pieces were found in the royal tombs of the dynasty founded in Ur by Mesannipada (Lower Mesopotamia), as the pieces called the standard of Ur or the lyre of the bearded bull. In addition, for 2650 BC, the lapis lazuli was quote in the famous poem called “Epic of Gilgamesh”. The legends say that Zubaidah, wife of Harun al-Rashid, built a fortress to guard the mines. Through the treacherous Badakhshan (Bactria), Lapis Lazuli was exported through trade routes to Mesopotamia, Egypt, Greece, Rome, India, China, and even to Japan. When Mesopotamia (Iraq) and Afghanistan established the trade between in 3500 BC, the lapis lazuli was present. It continued until the third millennium, when for a period of 200 years ceased the use of lapis lazuli. Divided into small city-states (Eridu, Ur, Uruk, Larsa, and Lagash), the summer country (2500 BC) fought constantly. The monopoly of lapis lazuli changed hands regularly. With the discovery of the origin of lapis lazuli, we find numerous uses. Queen Pu-abi (2500 BC) in the city of Ur in the summer also used ornaments of lapis lazuli. In addition, in the royal Sumerian tombs of Ur, located near the Euphrates River in lower Iraq were found, more than 6000 beautifully executed lapis lazuli statuettes of birds, deer and rodents, as well as plates, beads and cylindrical seals. In Susa, lapis lazuli also embellished the palace of Darius the Great (522-466 BC). So universal was its use in early times that we find engravings on cylindrical stamps and other forms of primitive jewelry between Babylon and Assyria. Another of the great civilizations that widely used lapis lazuli was Egyptian. There were discovered in the pyramids of Dashour (burial sites) dating back to 3000 BC, thousands of jewelry items, many of lapis lazuli. The lapis lazuli powder was favored by the Egyptian ladies as a cosmetic eyeshadow. In addition, years later, people used as a pigment. Do not miss our next post about Lapis Lazuli Color: Ultramarine. The first recognized geographer who visited the mines was the medieval Persian Estakhri in the X century. The famous archaeologist Georgina Herrmann noted that there are four mines located in Chilmak, Shaga-Darraii-Rabat-i-Paskaren, Stromby and also in Sar-e- Sang at altitudes ranging from 1830 to 5180 meters. 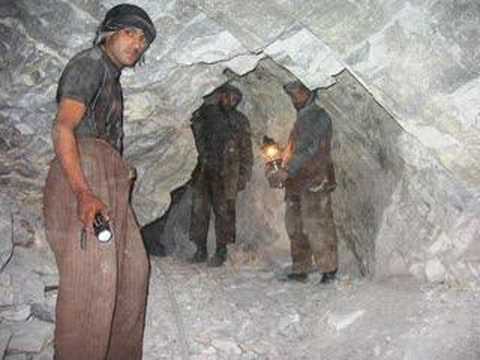 The Sar-e-Sang mine is the only mine that works today. The miners accept seven mines located between Sar-e-Sang, named from one to seven. The best quality lapis lazuli comes from mine number four. The extraction process of this mineral was the same from its origin in the prehistoric period until the 19th century. In the 1900s, dynamite was introduced into the mining process. From 1800, most of this process was described by Lieutenant John Wood, who was sent by his boss Alexander Burnes to Central Asia where Russia, China and British India were in an uncomfortable proximity, to investigate all possible Invasion routes from Central Asia (mostly by the Russians) to India. Wood arrived at the Sar-i-Sang mines (there you find the best quality lapis lazuli), where the Kokcha valley shrinks to a width of barely 200 meters. At that time there was a complex of six mines (now several of them in disuse). The mines were excavated like a cave in the mountain at five hundred meters along a steep and dangerous path. The roofs did not have support, and could collapse at any time. For centuries, these mines were the only source of lapis lazuli. The deposits are in the Tirich Mir massif of 7780 meters, in the Liazur Diaria valley. The material extracted in the deposit at a height of 5000 meters was concentrated in Firgamu, and from there according to two routes, it was distributed. The first descended by the rivers to Samarkand and Merv in Turkestan. The second crossed the mountain range by the pass of Mandal and by Chitral it descended to the valley of the Indus. Much later in the Chilean Andes at more than 4000 meters high, a second deposit was found, in the Ovalle mountain range, in the province of Coquimbo; however at present only 2% of the mineral extracted from Flor de Los Andes is first quality. All the deposits present the common problem of not being able to be exploited with assiduity, since by being located at high altitude (something common of all of them), the extraction only occurs during the summer season. The miners lived in stone huts at the foot of the “blue mountain” and climbed the steep slope towards the mines. There were a series of corridors and caves, joined by narrow, dark passages, often only suitable for tracking. The miners came from all over the country. They were poor, poorly paid and went hungry. Winter was the main season for extraction, especially because there was no work to be done in the fields. Currently it is the other way around. The three short months of summer make it the main extraction season. It is when the steps are clear and the miners can carry it out. The neighbors of the valley of Chitral speak of the regular caravans of summer in mule and of men that are loaded wiht lapis lazuli who leave the mountains to the plains. The miners had a dangerous job. They worked on their knees and lit fires with wood to soften the rock. They had to transport the wood from a considerable distance, since there was nothing in the area. The rock is very hard to find, but when they did, they separated the surrounding rocks and Lapis Lazuli minerals by drilling a hole in the wall. Inside the hole, they placed a pile of hot coals and covered them with the remaining stones. Lapis lazuli is also heat resistant so the other rocks warmed while the lapis lazuli maintained a certain temperature. The fire was extinguished it with cold water (also carried from the bottom) and the sudden cooling caused the rock to break and caused excess rocks and debris to fall from Lapis Lazuli. The miners then hit the big pieces with hammers, so that the stone would come off. The mining process today is just as dangerous due to the dynamite they use. There is no kind of security procedure such as helmets or glasses. The miners penetrate deep into the mountain along low and narrow passages, place their explosives, ignite fuses and make a run for the exit before the explosion fills the corridor with rocks and dust. They wait for the dust to settle and then they go to collect what has fallen. After the mines explode, the miners put lapis lazuli blocks in a backpack. This is a very dangerous trip, since the mountain is almost vertical. Lapis lazuli transportation lasts about nine days. Each mule carries approximately 40kg. A large quantity of this material arrives in western Pakistan. The mujahideen charge a tax that can be up to 50% and the Pakistani government charges taxes at the border near Gharam Chashma that is usually 20%. Lapis lazuli is in three Persian colors: Nili (dark blue), assemani (pale blue) and sabz (blue-green). Afghan fortune hunters pay the mujahideen for mine rights, but local workers do the real work. After recovering their investment from the sale of lapis lazuli, investors often divide the profit with the miners. From the origin of lapis lazuli, we discover that he has been involved in different conflicts. Moreover, the situation is not different today. While Afghanistan has the world’s largest reserves of lapis lazuli (of the best quality), the country barely receives benefit from this immense wealth. In 2016, the report from NGO Global Witness about the conflict with the mineral put the country in the international spotlight. They launched a campaign to declare lapis lazuli a “conflict mineral”. The report stated that the mining area of northern Badakhshan, was “deeply destabilized” by a violent competition for control of the mines, between local strongmen, lawmakers and the Taliban. The president of Afghanistan joined this campaign. The person in charge of the study warns, “The mines produce a tiny fraction of the benefit that should have an impact on the country’s wealth, and they have become instead a source of conflict and instability that could have global consequences”. He adds, “Unless they act quickly, these mines will not only represent a missed opportunity, but a global threat to the future”. The hope for the economic growth of the country and its independence from international aid lies in the estimated $1 million of mineral reserves that could generate $2bn of annual revenues. Is not an ideological fight it is a business war. In this war, the Taliban are in control of most of the income from the mines, being their second source of income behind the drugs. The greed for the mines has triggered a series of violent incidents in Badakhshan. It has put an entire district without government control for two years. Abuse around the mines, especially the lack of benefits for the local people has created significant support for Malek’s takeover of the Lapis Lazuli mines. The same goes for the Taliban. People support them to take revenge on the government. The Taliban have infiltrated Badakhshan much more than they did at the height of their power in the 1990s. There are also credible indications that mines are a strategic priority for the Islamic State in Badakhshan. The Ministry of Mines cannot give complete information on the income and production of Lapis Lazuli. Zulmai Mujadidi and Commander Malek have links with high-level politicians. There is no real control, most of the stone is exported to China and with prices that reach up to €1,200 per kilo of scale one minerals (there are 12 scales to measure the quality of the precious stone). Is also exported, a part of the extraction, to Pakistan and to a minor extent to India, where there is no type of control to certify the origin of the material. The lapis lazuli route begins in the Afghan capital, Kabul, where merchants buy the stone in metal boxes. From there they travel to Peshawar (Pakistan) to return to export precious stones to Chinese cities such as Hong Kong. The illegality of the process has made a market of contraband and bribes flourish quickly. The lapis lazuli lies at the center of a very competitive market, especially for the locals who extract the rock in Afghanistan, who often die for access to the Lapis Lazuli deposits. In fact, in many places the extraction of stone was until recently illegal. Due to controversies and secrecy regarding extraction practices, the locations and richness of Lapis Lazuli deposits, exact production numbers and reserve sizes are difficult to estimate. Afghanistan has captivated and benefited the whole world with the most beautiful lapis lazuli since ancient times, that is why I sincerely believe, dear reader, that the time has come for the people of this beautiful country to receive the benefit of the immense wealth they possess. What do you think? Leave us your comments on this topic, and subscribe here for more content like this. Thanks for the detailed article on Lapis lazuli origin, it’s worth reading. Thank you and You are very welcome! Hope you will find even more interesting posts with our blog.